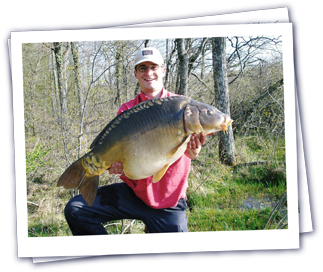 Carp Fishers Abroad started sending British anglers to fish on the continent in the late eighties – we have been organising carp fishing holidays for almost twenty five years now. 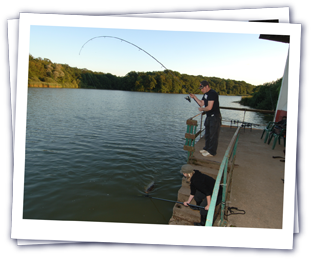 In fact, we were the very first company to organise carp fishing trips to France and had to virtually pay the first few parties to leave the safety of the UK and try fishing somewhere new! Today of course, everybody goes. The business started out when we realised how much better and faster carp grow the further south you travel. Hotter temperatures, more sun and longer summers seemed to allow fish to grow perhaps twice as quickly as here in the UK. For very good reason we are not allowed to import fish from the continent to the UK so we reasoned that if we couldn’t bring the fish to the people, we would send people to the fish! In the course of our work, we dropped on two beautiful French lakes; Chalet Lake and Lake Meillant, and set about creating the sort of fishery that you could only dream of. At about twenty acres apiece, both lakes were large enough that you could fish a half a dozen anglers without being on top of each other and both have areas of woodland and reedy banks where you can secrete yourself away if you prefer. Today, we like to let the lakes to a single party that take the whole fishery. On twenty acres, we only fish six anglers but now recognise that it is increasingly difficult to get a team of six mates who all want to do the same thing, so in addition to letting the lake exclusively we are also offering deals for individuals and smaller parties. On these weeks, we will still only allow six anglers to fish and where we have put teams together in the past, they usually all end up booking again the following year as one big group. There is something special about turning up to one of these French lakes and finding nobody there. A real sense of anticipation and excitement. These fisheries have popularly become categorised as ‘drive and survive’ venues. There will be nobody there to meet you when you arrive. Nobody to tell you what you can do, where you can fish and what bait to use. Or even worse, where you can cast. We don’t have a great list of do’s and don’ts and prefer the mantra that you should behave as you would have liked the chap before you to have behaved, take only photos and leave only footprints. We change over on Saturdays and ask you to arrive after 3pm on your first Saturday and leave by 11am the following Saturday, so when you arrive, even if there was a party fishing the week before you, there is no cross over. It’s like arriving at your own private water and like all good fishermen, you have to discover how to catch the best fish yourself. The good news is that everybody tries something different so the fish don’t get tuned into a particular bait or method. If any proof is required that our lakes are not another of the disappointing fisheries set up in France in recent years, it is that 85% of the anglers visiting our fisheries are doing so for the second or third time. Repeat business is the key to our success. Whilst France continues to be a Mecca for carp anglers, it is never actually quite as easy to succeed there as some articles would suggest. Eight out of ten fishermen we talk to blank (or as near as dammit) on their first trip. You can appreciate the problems more if you consider a Frenchmen reading of the wonders of British Carp Fishing who arrives at Dover with a car load of tackle and bait. He only has a weeks holiday and wants to catch some big fish. Where should he start and how do you think he would get on? In France as in England, the best waters are not public ones. If you have a week’s fishing holiday, Carp Fishers Abroad can put you straight on to the fish without all the hassles and unknowns that fishing other waters can present. 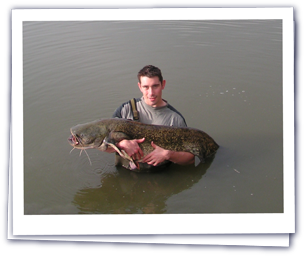 We can guarantee that you will be fishing some of Europe’s most consistently productive waters. Compared to the UK, it is hotter there in the summer but colder in the winter. Usually the lake freezes up for six weeks around Christmas. Our main season runs from the beginning or April through to the end of October with the very best weeks being through May and June. Once the weather gets properly cold in November, Chalet Lake has never done much good but Lake Meillant is further south, deeper and more sheltered and would offer some interesting winter fishing. Please follow the links at the top of the page to give you a flavour of our fisheries.